Heat oven to 350°F. Grease 12-cup fluted tube cake pan; lightly flour. In large bowl, stir water, oil and eggs with fork. Stir in muffin mixes until moistened. Pour into pan; spread evenly. Bake 50 to 55 minutes or until toothpick inserted in center comes out clean and top is golden brown. Cool in pan 15 minutes. Turn upside down onto heatproof serving plate or cooling rack. Remove pan; cool cake completely. In small bowl, mix powdered sugar, butter and lemon peel. Stir in lemon juice until glaze is smooth and can be drizzled easily. Spoon glaze over top of cake, letting some drizzle down side. 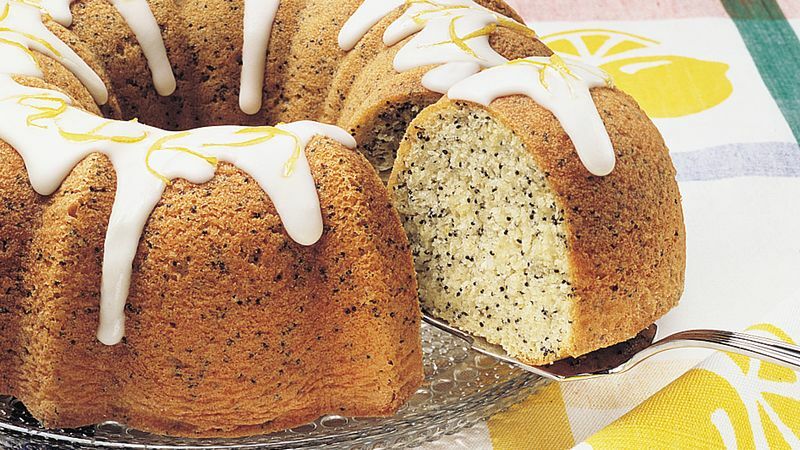 Fun facts: Each poppy seed measures less than 1/16 inch in diameter. It takes about 900,000 of them to make 1 pound! This cake is stunning as is, but you can make it even prettier by dusting it with powdered sugar and garnishing with edible flowers.